Bvlgari Omnia Indian Garnet is inspired by the exotic aura of India. 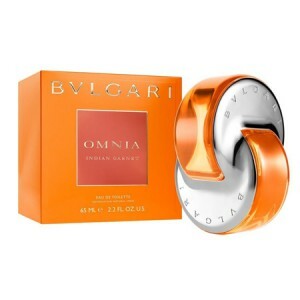 Bvlgari Omnia Indian Garnet 65ml. Eau De Toilette - The whole kaleidoscope of flavors from Omnia jewelry house Bulgari dedicated unique jewels. This spring box with perfume rare gems added mandarin garnet and perfume arsenal fans High perfume is ready to decorate fragrance Omnia Indian Garnet. This fragrance is inspired by the Indian nature, femininity, and this, of course, luxurious decorations. Fragrance Omnia Indian Garnet is the olfactory embodiment of bright Indian fabrics, exotic Indian nature, spices and luxury jewelry. House Bvlgari often turned to India in the design of their jewelry, but very rarely in perfumery. Therefore fragrance Omnia Indian Garnet is an ode to mysterious India at the highest level. Hindus since ancient times and appreciated the skill of the perfumer, and craft jeweler. They believed that the flavors - a link to the harmony of soul and body, which helps to communicate with the gods, and jewelry - stones abstractors disease and bring good luck. Release Date : 2014 Manufacturer : Italy Made in Italy Gender : Female Classification fragrance: oriental, floral Top notes: mandarin, orange note "Hearts": osmanthus flower Base notes: amber Perfumers: Alberto Morillas. The inspiration for its creation was the Indian exotica, with its mystical and noble content. Beginning splashes of citrus freshness, fragrance composition transmits championship osmanthus. Spicy oriental base notes of amber plays. Bottle of the original form with the symbol of the brand is decorated with accents of bright terracotta color. An unforgettable fragrance to create a bright, individual and stylish image.